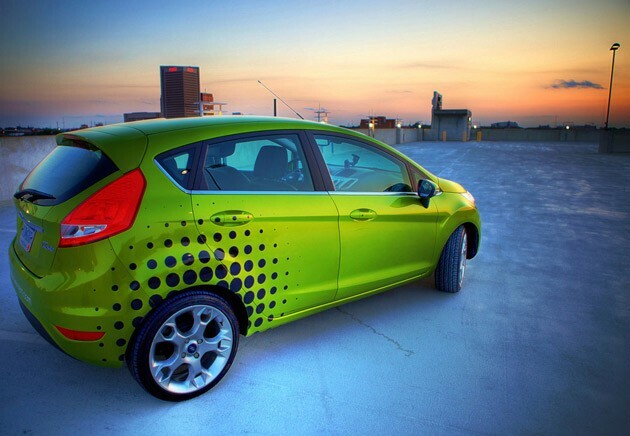 Ford has given Fiesta buyers a chance to turn their purchase into something a little unique. The company is offering a number of customization options for the new pint-sizer, including a rash of interior options and exterior graphics. For starters, the car can be equipped with a number of interior lighting accents, including an illuminated shift knob and door sill plates, or LED mood lighting for the cup holders and foot wells. Outside, Ford will be happy to set you up with an aggressive body kit and rear spoiler, for a price. That’s fancy, sure, but the neat part is wide variety of vinyl graphics available straight from the factory. Ford calls one of the decals a “body tattoo,” but it’s really nothing more than a big sticker that spells out Fiesta along the side of the vehicle. Those looking for something a little bolder can choose between over 18 other designs. Make sure to stop by your favorite Maryland Ford Dealer (that’s us Waldorf Ford!) and check out the really exciting and fun Ford Fiesta. This is interesting to read new body kits,graphics and accessories for Fiesta.You have given good information about it.I think that it will be a great news for Ford users.